The spread between crude oil traded in the international markets and the US benchmark, the so-called Brent-WTI spread has blown out once again. It's now approaching levels not seen since February. What's going on? What happened to the Goldman's forecast of convergence between the two indices, as more US crude is pumped from the Midwest toward the Gulf of Mexico (see post)? In the past the bottleneck was in moving growing US supplies from Cushing, Oklahoma (where WTI settles) to the Gulf. While that problem has been at least partially solved, the oversupply of crude now simply shifted from Oklahoma to Louisiana. FT: - Surging shale oil production along with severe restrictions on exports has led the US oil market to diverge from the global market in recent years. This week US benchmark West Texas Intermediate crude fell to a five month low of $91.77 per barrel, almost $20 per barrel less than the global marker Brent. But until recent months infrastructure constraints have made it costly to move oil from inland shale formations to the country’s main refining hubs in Texas and Louisiana, limiting the benefits of low prices to the wider US economy. With more oil now able to flow through pipelines, the Gulf Coast market is also diverging from Brent. On Thursday, Louisiana Light Sweet, the Gulf Coast benchmark, hit a low for the year of $95.30 per barrel. Its discount of $16.01 per barrel to Brent, was easily the highest on record in Reuters data going back twenty years. Traditionally LLS has traded at a premium to Brent, reflecting its superior quality and the cost of shipping to the US. Surely at these spreads it is worth shipping US crude from Louisiana to Europe to sell at Brent spot prices. After all, US crude is of the quality that Europe needs (vs. the heavy Saudi crude). It's not so simple however. Back in the 70s, the US Congress made it illegal to export domestically produced crude oil without a permit. And permits are tough to get these days, given how unpopular the notion of US oil export seems to be. So much for the concept of "free trade". 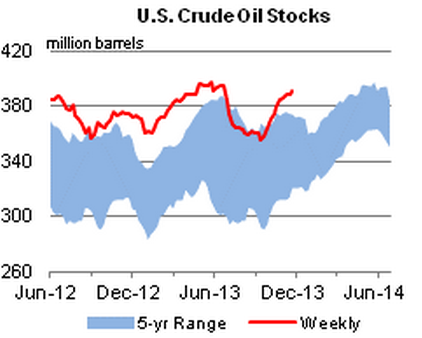 Instead US crude oil inventory continues to grow, widening Brent-WTI spread, as domestic production expands. And while there is a restriction on crude exports out of the US, selling refined products such as jet fuel and gasoline abroad is allowed. FT: - The low prices are a boon to Gulf Coast refiners, which can pick up crudes at low local prices and then sell refined, products such as gasoline and diesel, which can be exported from the US freely, into the international market at high prices. At about 3m barrels a day, exports of finished petroleum products from the US are running at three times the rate of eight years ago, according to US government data. 1. US refineries are loving this. The government is holding down domestic crude prices by limiting exports, while allowing refiners to sell as much gasoline abroad as they want. Refined products abroad are generally priced based on Brent, allowing the refineries to capture the spread. In effect the US government is subsidizing the refining business at the expense of crude oil producers. And here is how the stock market is reacting to these recent price changes. 2. This is putting pressure on nations who traditionally sell crude to the US. While in the past they were able to sell their crude close to international prices, they now get paid much less due to Louisiana Light Sweet becoming significantly cheaper than Brent. FT: - Imports to the Gulf Coast tend to be priced off local benchmarks including LLS and the Argus sour crude index, a basket of four heavier Gulf Coast crudes. With Gulf Coast prices falling, exporters such as Saudi Arabia and Venezuela are receiving less revenue for their sales into the US. The discounts of US crude show no sign of ebbing with oil inventories continuing to rise as production grows, and many refineries remaining closed for maintenance. Needless to say, these nations are not happy with the US as they now have to find alternate buyers in order to get the full price for their product. And many in the US are quite happy with this outcome. When Louisiana crude was trading at a premium to Brent, analysts thought that by improving the transport system from Oklahoma to the Gulf will eliminate the Brent-WTI spread. Instead it simply shifted the discount further "downstream". And with that came other unintended consequences that often result from uneven regulation.